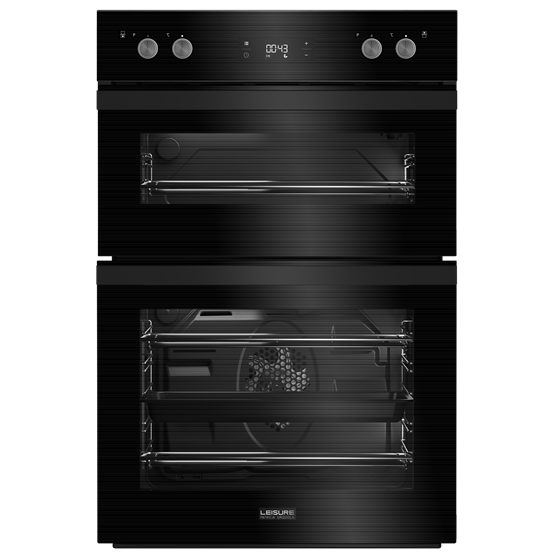 This Patricia Urquiola designed double oven features a multi-function main oven and a secondary oven and grill, with a combined total of 12 functions to experiment with. A programmable touch control LED timer will help you stay in control of meal times, while also adding a modern, professional finish to your kitchen. Make a lasting impression at the dinner table, whatever you’re cooking, with 8 innovative functions that help you cook a variety of different dishes. For fast, restaurant-style results, try out the 3D cooking function. Making sure your meal leaves the oven at exactly the right time, the audible timer can be set to automatically start and stop at a pre-selected time, helping you stay in control of meal times. The heating element that surrounds the fan ensures that heat is distributed evenly and consistently throughout the oven, offering quicker cooking times and perfectly even baking and roasting results. Add a healthy twist to your dishes by using the dedicated grill. The large grill tray is supported by telescopic runners, so it can support itself without being held. Heat is also evenly distributed across the whole tray, guaranteeing a golden crispy finish every time. Providing a simpler solution to oven cleaning, our Cook Clean liners sit on the side walls of the oven cavity, catching grease from inside the oven. By removing the need to scrub the oven walls, the specially coated panels make it easier to keep your oven clean. The nano coated glass oven doors are specially designed to resist grease and dirt, making the inner glass door easier to wipe clean after use. The coating also helps the glass stay spotless for longer, even after multiple uses. The inner glass of this oven’s door can be easily removed. Simply slide the glass out to clean sauce splatters and stains from those hard-to-reach spots. The oven's side racks are simple to remove, making your oven interior easier to clean. For a sleek and stylish finish, the oven's knobs can be pushed in and popped out. When pushed in, the resulting smooth surface on the glass panel enables it to be easily cleaned after use. Shed some light on your food's progress with the interior light, which gives you clear visibility of your food whilst it cooks in the oven. Bad Points: Being short I find the controls on the side of the knobs very difficult to see, to such an extent that I have had to transpose the various functions and temperatures, by means of a marker pen, to the front of the knob. Only buy this if you are taller than 5 foot 2 inches. Bad Points: Difficult to read dials when in double oven unit - but you get used to it Grill pan is a bit flimsy it buckles when using the main oven grill - It does go back but I suspect it may become permanent Poor user manual - print quality is poor and needs more cooking info on setting and times. Bad Points: Functions on control knobs, can be difficult to see.